The Wrong Earth #1 Advance Review – AiPT! If you enjoy superhero comics you gotta do yourself the favor and check this out. A new comic book publisher called AHOY Comics is entering the fray this September and their opening salvo is The Wrong Earth #1. 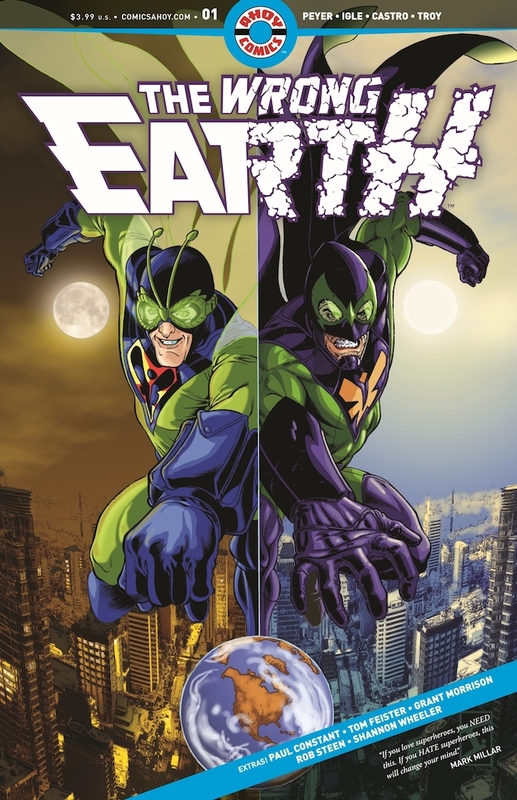 This series explores two heroes from a different dimension (written by Tom Peyer with art by Jamal Igle) who have very different ways of working. Witness a Golden Age “aw shucks” version of a hero juxtaposed with a gritty, dirty-mouthed, blood-soaked version crossover. AHOY Comics launches with a biting superhero satire! On one world, Dragonflyman and his sidekick Stinger enjoy a life of adventure. On another Earth, the Dragonfly hunts criminal parasites like a lethal exterminator. But what happens when these two heroes change places? By Tom Peyer (Captain Kid, Hourman) and Jamal Igle (Black, Supergirl)! If you’re a fan of books like Grant Morrison and Frank Quitely’s JLA: Earth 2 you’re going to love this. It plays around with different eras of superheroes and pushes the characters to grow really fast when confronted head-on with a different way of thinking. This book is quite robust in content starting with Peyer and Igle’s 20-page main story, including a few Q&As, a story by Paul Constant and Frank Cammuso, a prose written by Grant Morrison, and even closing with a single page cartoon from Shannon Wheeler. It’s more of a magazine than a comic because of these added features, which is one reason why this is the perfect first issue from AHOY Comics. This book feels very robust and worth your dime and contains a lot of content. As far as the main featured comic book story goes, Peyer and Igle knock this one out of the park. Peyer does a good job setting up the Golden Age version of Dragonflyman on Earth-Alpha who is not at all worried about a laser net hellbent on killing him and his sidekick. We get a good introduction to these heroes as well as the villain who is perfectly over the top and zany. Just as the plot begins to go as you might expect, the comic smash cuts to Dragonflyman in Earth-Omega where blood flows and violence is very dangerous. The horrors of this world are laid out very well, which goes a long way in setting up the eventual crossing of universes. Make no mistake, this book does not hold back and is very modern in the approach of its story. Igle draws a great book too with sharp detail and a very modern look. Aided by inker Juan Castro, color artist Andy Troy, and letterer Rob Steen, it’s in the color where the worlds look quite different. The Earth-Alpha Golden Age style is bright, as you’d expect, and the grittier Earth-Omega is darker and more sullen. Even the costumes match their style of comic book with Earth-Omega’s Daragonflyman sporting a six-pack and ripped muscles and the Earth-Alpha Dragonflyman’s clothes being a bit baggier. Body language goes a long way in revealing these characters too with Earth-Alpha being a bit more lumbering and slow. I’m excited for the second issue in this series because the main narrative hasn’t quite proven itself to be starkly original in its approach. The dual dimensions and the exploration of heroes from different eras have been done before and while it’s done very well here I’m still waiting to see a distinct statement or direction that is completely original. Another minor gripe is how deep the book is going with the character. So far it’s an action-centric superhero tale without much in the way of character development. Again, I think we might get more in the second issue–this is the punch to the teeth sort of opening issue after all–but it has yet to be revealed who these characters really are. A great first issue for AHOY Comics and a great first issue for Dragonflyman. If you enjoy superhero comics you gotta do yourself the favor and check this out. It’s meta in its approach, making a statement about superheroes you won’t want to miss. The book overall is quite robust with content too and well worth a read outside the main story. A strong opening issue, not just for 'The Wrong Earth,' but for AHOY Comics as a whole.